"Beauty is truth, truth beauty. That is all ye know on Earth, and all ye need to know." Yes, indeed. Let's blame it on the Greeks. Put it this way - how many Classical Hellenic statues in the Royal Ontario Museum put you in mind of Susan Boyle? Rather, as Plato put it, "therefore if we are unable to net the good in a single concept, we must use three to capture it, namely beauty, proportion and truth." From this comes the age-old mindset that it, or he - or especially she - has to be beautiful to be good. Simon Cowell certainly knows the concept and its power. 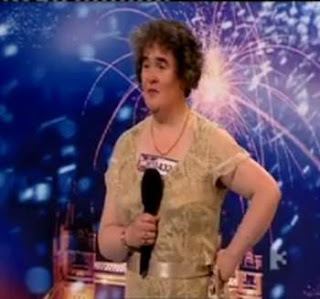 He did his best to look surprised (even though he owns the show) when the self-described "short and plump" Boyle performed her jaw-dropping number from Les Miz while auditioning for the show Britain's Got Talent. But it's on American Idol - now down to its final five with the ouster of Lil Rounds and Anoop Desai this week - that beautiful-equals-good (and the corollary, ugly-equals-bad) has been honed to a science. It's particularly at play in the "audition weeks," the only part of the show some people watch because of the "car-crash factor." There, the deluded far outnumber the talented, and out-ugly them too. Remember William Hung? As soon as you saw his crooked teeth, you knew he was there as a joke. There's no way anything but a mockable version of She Bangs was coming out of that mouth. Cowell himself has always tended to go straight to aesthetics when judging ("You look like one of those creatures that live in the woods with those massive eyes," he famously said to one lemur-like auditioner). The rule is, "If they're ugly, prepare to hear them croak like a frog. If they're pretty or handsome, get set to hear an angel sing." Once past the Hollywood-audition gauntlet, however, Cowell remains obsessed with contestants "looking" like an Idol. One of the best voices ever on the show belonged to Mandisa, the unfortunately plus-sized diva who was the object of endless weight jokes from Cowell through to her ninth place finish in 2006 (starting with the "we're going to need a bigger stage" crack during her audition). Where somebody like Season Two champ Reuben Studdard could get away with being overweight, it's unthinkable for a less-than-beautiful woman to win (believe it or not, both Kelly Clarkson and Carrie Underwood were lauded for being "ordinary-looking" in their pre-makeover phases). As for this season, most figure it will come down to the prettiest boy, Adam Lambert (who admittedly has amazing pipes), and geeky-handsome Danny Gokey (who has the added sympathy element of being a widower). But it's not Plato that made Jessica Simpson a singing star, but MTV (as per The Bugles' Video Killed the Radio Star). The fact is, when we didn't have to look at them, you could be unpleasing to the eye and then some. You could even be, as Eric Burdon described himself in Spill the Wine, "an overfed, long-haired leaping gnome," and still score as many groupies as Mick. I loved the Atlanta Rhythm Section back in the day, but they weren't going to win any beauty prizes. Both Janis and Mama Cass weren't conventionally beautiful, but they had voices that will live forever. Maybe Canadians are less Greek than our friends to the south. After all, Rush are rock gods here. Interestingly, Plato's Republic only goes so far in the real world. I don't care if my auto mechanic's face could stop a clock as long as he keeps my mini-van purring. Frankly, I don't trust a skinny chef. And active prejudice against their looks would have kept me from seeing movies by Hitchcock or Kubrick or Peter Jackson, or reading books by Truman Capote or Fran Liebowitz or seeing musicals by Andrew Lloyd Webber.